Here were the qualifying factors that made The Fluffy Movie suitable for this challenge and other comedy specials not so much: It had a basic plot, played in theaters around the country and hit the time requirement. So as much as I would love to watch more comedy as part of this Challenge. It would not be good or proper to do so. It would literally be cheating. Cheating at watching movies. What a concept. The gist: Unlike some of his previous comedy specials, Gabriel Iglesias frames his comedy routine around a pre-filmed story. We learn about his family, his unusual birth and even how he got into comedy before he jumps into the random jokes. It’s a little confusing at first, but it’s easy to sink into. Once the comedy starts, it becomes clear that this special hit the theaters for a reason. The previously untouchable subjects are laid bare and discussed. There’s some serious tales of soul-searching in this special, particularly around Gabriel Iglesias’s identity as the “Fluffy” guy. In the last few years, he’s lost a ton of weight for health reasons. But without being an overweight guy, who is Fluffy? How can he work to be healthier without losing who he is? Add in even more change to his identities as son, father and boyfriend, and you have a special filled to the brim with pathos. What I “learned”: You know that guy who is really fun when his addictions or dysfunction are ruining his life, but is really boring when he straightens out? And you’re not really sure how to feel because you fell into friendship with him when he was outwardly messed up? That’s Gabriel Iglesias in this special. I know it’s unfair to say it, but there is a limit to how much one can talk about personal tragedy and still be funny. There is a perfect way to do it, and it is in Margaret Cho‘s special I’m The One That I Want. That is the yardstick by which I measure personally themed stand-up comedy. A personal story has to be peppered with just enough snark to be objectively meaningful to other people besides you. It’s a hard balance, but it must be observed. If it isn’t, you end up with The Fluffy Movie. 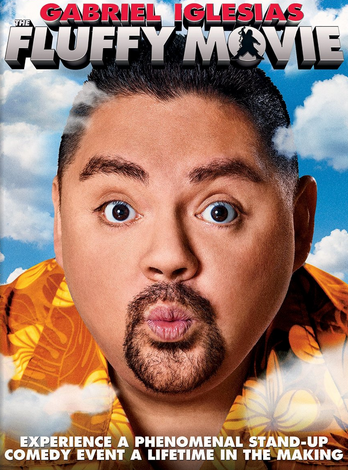 See this movie if you like: Any of Gabriel Iglesias’s personal material. This movie is basically an oral storytelling session of every subject Gabriel Iglesias has refused to speak on in the past. Which, for a fan, is pretty awesome. I personally love the fact that we get to learn more about his long-lost dad and road to weight loss. I like that as a fan. So it’ll definitely tickle any fandom itch you may have. Avoid this movie if: You’re expecting a straight-up comedy special with lots of punchy sections. This just isn’t that. I expected that, and I ended this movie feeling awkward as feck. So save yourself some grief, and maybe only watch up to the first hour if you’re looking for laugh-out-loud funny stuff. After that, it’s the Actor’s Studio with Fluffy.